with numbers scaling nicely with more currency investment. You can start this build with a few EX (or even less/SSF! ), but also spend hundreds to get a lot tankier (or deadlier). The build's main spell is the newly added Soulrend, which has a pretty unique feel to it, and combined with Bane enables a very relaxing brain-dead playstyle, much like totems or brands. You have slowly moving homing projectiles with which you can actually walk along, and clear some single mobs or tough mobs with Bane. The posted absolute trash tier items should prove it is very much playable without spending any real currency. I'll leave those links here, showing how far you can get with little investment, I can easily run red tier maps with almost no gear. The only actual core item that is somewhat expensive is Apep's Supremacy, which you can basically rush to get a lot of quality of life - increased maximum elemental Resistances, bleeding immunity and faster ES recharge start! This set is worth about 9ex, not counting boots, those are a lucky trade, those alone are worth 10+ex AFAIK. That gear currently equals 12.3k ES. You'll want to get those stats as high as possible, there are other mods that are worthwile (e.g. 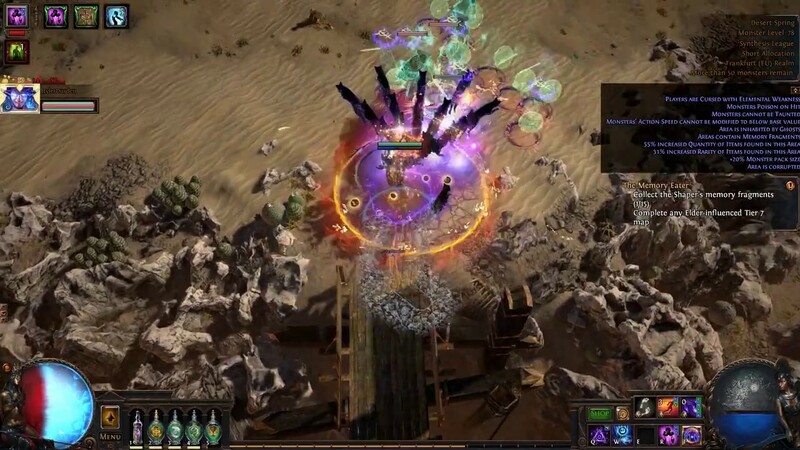 delve full-life, crafted chaos damage or damage over time), but those are the main focus, you can basically ignore other mods. Here we'll want a Apep's Supremacy. You'll want to rush to this item as soon as you drop an Exalted or something similar, it enables you to ignore bleeding, and adds +3% to all maximum Resistances trough permanent self-poisoning and gives you up to 50% faster start of Energy Shield Recharge. Until you can buy yourself one - or make one yourself in the temple- , just run any ES shield like I used to. You should run a anti-bleed flask instead of a anti-shock flask until you get it! Dead simple, just a high ES chest, my current one is very bad and not even 6-linked, you'll want to go for 700+ ES. You're off best if you do not count the resistances you might have on here, since the higher tier chests will not have any on them to maximize ES (up to 5 mods taken including quality crafts), or you might have issues adjusting your resistances as soon as you get a good chest if you're looking to upgrade. For this slot you can either get a Sin Trek or rare boots. If you go for a sin trek, you'll get pretty high ES for quite the budget, including movement speed, but you'll drop the resistances you can get from this slot. Rare boots with acceptable ES and resistances are not too expensive, and can make gearing pretty easy as you won't drop a slot of resistances. If you're rich, you'll want ES + resistances + movement speed. This is a pretty simple slot, you'll just want as high ES and high resistances as you can get for your budget. If you're rich, you can go for elder gloves with the "+#% to Non-Ailment Chaos Damage over Time Multiplier" mod on top, or even elder Fingerless Silk Gloves with it. This slot is pretty much like gloves too, just pump up ES and resistances as high as you can. If you're rich, you can try to get the delve mod "Nearby Enemies have -9% to Chaos Resistance" plus the mentioned citeria. Soulrend deals #% increased Damage for a damage boost. Malevolence has #% reduced Mana Reservation for quality of life i.e. a bigger mana pool (soulrend eats mana). For the belt you'll want to run a Bated Breath, it provides quite some ES, the very comfortable 50% increased Energy Shield Recharge Rate mod, and a little bit of damage on top. By far the best option for a very small price. The ES provides some good boost to your health pool, and you'll need the Strength to run the Immortal Call setup, but since you also benefit from Dexterity and Intelligence + all is the nicest mod to have. You can also switch resistances and attribute mods from the amulet to the ring if it suits you. 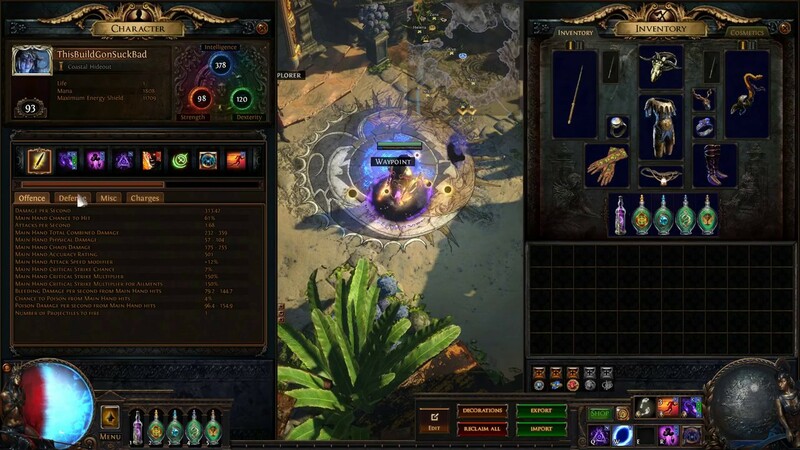 If you're looking for ways to spend money, you can try to meet those criteria and either make it an amulet in the Syndicate Hideout, or get an elder base with +#% to Non-Ailment Chaos Damage over Time Multiplier. On one slot you'll need to run Dream Fragments, because this will prevent you from getting frozen (which would happend all the time as your life pool - which will be 1 - determines this chance). The maximum mana is a small theoretical ES boost too, and the resistance is neat as well. For the second ring you'll want a high ES, high resistance ring with the crafted mod #% faster start of Energy Shield Recharge. This slot is very nice to get last when gearing as you can fix your resitances pretty nicely with a ring. Best damage flask for chaos damage over time builds like this one. More damage + burning removal (which you need for ES, because DOTs prevents recharge). Curse removal, very much needed for mapping. Grants you tons of evasion rating, which scales well with the Stibnite Flask(s) and the Dexterity you get from the tree natually or from items, as well as shock immunity which prevents those damage multipliers on you. Simply the best option for movement speed, you can switch the prefix natually if you prefer another movement flask. The effect is entirely useless most of the time, since Witchfire Brew already covers that, but having a lot of usages on your anti-curse flask is very comfortable which I value more. If you don't, you can also switch this for any other utility flask, e.g. an Aquamarine or even a Bismuth flask. The normal Jewel and The Golden Rule enabels self-poisoning, which grants you +3% to all maximum Resistances from Apep's Supremacy. On the normal jewel you'll need the #% change to poison on hit mod. The Golden Rule is very cheap, so you can easily add more CC immunity by using one with a corruption implicit. I personally prefer main immunity over hinder immunity, because it feels more impactful. If you don't care about that, an increased damage implicit is also pretty cheap. You can completly ignore the roll here too. For your third gem slot you want a Abyss Jewel with +# to maximum Energy Shield and #% change to gain Onslught for 4 seconds on Kill. This is the best way to get onslaught without using a flask for it. Getting good rolls on this jewel is kind of expensive, and higher rolls on the onslaught mod will feel very smooth, but diminsh with higher pack size maps. If you can get any other useful mods, go for it, but there is nothing too worthwile on abyss jewels besides stasts and resistances. #% faster start of Energy Shield Recharge while affected by Discipline. Those are expensive per se, and if you are insanely rich you can look out for one with the additional mod +#% to Non-Ailment Chaos Damage over Time Multiplier while affected by Malevolence and Gain #% of Maximum Mana as Extra Maximum Energy Shield while affected by Clarity, but those combos cost 30+ ex. If you already have skilled the slot but no currency, just bridge that with another normal jewel with ES or spell damage modifiers. All the links besides Unleash and GMP are just staight up damage boosters. Unleash enables a very comfortable playstyle, running alongside your previously casted projectiles, and recasting every few seconds. You'll rarely be actually spamming soulrend, so this link enables a very relaxing playstyle. GMP is needed for map clearing, which you can switch for Void Manipulation in boss fights if you're the kind of person who likes to carry around extra gems for bosses. If you have a 5-link drop Controlled Destruction, with a 4-link drop Swift Affliction. b) help killing tougher enemies like rares or bosses. The Enfeeble (or Temporal Chains) is a defensive tool, which will make fighting bosses a lot more comfortable. Since those situations occur pretty frequently I've linked the arcane surge in here, which will not equal 100% uptime, but suffice IMO. Those are your auras, with discipline being the most important. It boosts your life pool a lot, and enables you to run a Watcher's Eye. The clarity will proof useful as soulrend eats a lot of mana. Malevolence is a nice damage boost, which you can drop until you can buy yourself a lvl 3 or 4 Enlighten, a 3 will work, but mana might be tight sometimes and running no regen maps becomes really unpleasant. I have not yet found a perfect level for clartiy, but having about 200 - 400 Mana unreserved is pretty nice when playing soulrend, so be careful to not overlevel it, as you'll have a hard time casting anything if you do. Currently I'm on a 3 Enlighten and level 16 Clarity, which works pretty smoothly. Standard setup that grants you immunity to physical damage for a short period of time, which is very comfortable and makes you even tankier. You can pretty much level this as high as your strenght allows you to (mind the level requirements of CWDT) since your life pool will be very high anyways. This is your movement skill, you might want to link a Empower in there for faster recharge if you can, but it is nowhere near neccesary. The other option is to link Arcane Surge, if you're the kind of person that likes to move with Flame Dash instead of walking, but I'm not, so this would be a wasted slot for me. The Chaos golem grants you physical damage reduction and adds some more other target for enemies to attack, which is a nice bonus IMO; if(!) you have enough strength you can also run a flame golem for increased damage if you feel like doing that. "Hello everyone, after years of playing other people's builds, this league I dediced to do a build completly myself and I'm quite happy with the results, so here is my very first "probably-not-perfect" build for anyone interested. What I wanted to do was play the new chaos skills and create a tanky ES character which also can clear most - if not all - content, and I think it worked out pretty well." Since this is my first build guide, I'd very much appreciate feedback, what you'd like to see added, etc. If you actually read all of this, thanks a lot, please leave a comment and let me know your thoughts or questions. Cheers! Hey man! Pretty cool looking build! Chaos damage witch builds are always cool to look at as one of my favorite builds of all time was an ED Contagion Wither build. I think you did a great job at capturing how easy it is to build this character with almost no investment. That's very cool! These are not necessarily true, you can change them to your own experience with the build. Explain why you chose your current gear, and how you can improve on them. You can also explain why it is a quality of life to get Apep's here. This would make your build-guide be much better! And if you got the time you can always make a Video section showing off the build on where it is great and where it lacks. I hope I was of help! Have you tried/done the numbers for slower projectiles? I was thinking of soulrend - controlled - void - efficacy - slower projectile - empower. I don't think empower is good for chest unless you can get a +1 gem for chest or something. Currently I have a 6l for Bane but much switch it out for a delirum glove and it'll prob clear up to t16 without problem. Slower Projectiles is basically useless as it only scales up the hit damage, but not the DOT damage, and that is the damage you're trying to scale. +#% to Non-Ailment Chaos Damage over Time Multiplier will not work with the hit damage but the DOT damage, so scaling that is useless for Soulrend. A level 4 Empower is still worse then the worst damage link (Controlled Destruction), but yes if you actually can get a good chest with the +1 Level of Socketed Gems implicit it will be a lot better. Thanks a lot for that build, just quick question, can you add section with end game gear? Yeah, I'll post some updated (mid-range) gear soon, and add some gear tiers to the PoB, the current one has higher tier items in it, but they are still upgradeable damage-wise and even ES-wise, although those even get to 12k. Have you tried it on single target like bosses that don't die in one shot? Soulrend duration is really low, 0.4s base. So slower projectile might mean it can actually hit twice per 1 cast, effectively doubling your damage per cast of Soulrend. I am also curious why Unleash and not Void manipulation? I have played on my ED/Contagion Occultist with Soulrend (not too much because I don't have enough mana to cast it repeadatly), and I had no trouble one shotting every monster so unleash actually didn't feel needed at all, just a single cast with GMP. I would suggest trying Soulrend > Controlled Destruction > Efficacy > Swift Affliction > Void Manipulation > GMP/Empower(3 or 4). I believe spell damage of soulrend (of most spells) scales a ton more than support gems the higher level you get it. So by getting a 21/20 Soulrend, you probably benefit more from Empower (3/4) than from another support gem (except controlled destruction). Easy to check in Path of Building. My build is self built itself, I am very happy with it as well. I did not know about APEP! THANK YOU!!! It is perfect and I have been looking for bleed immunity! With the ES leech, I am on fire most of the map and just laughing from ignite, but 20 bleed stacks will wipe me out... well NOT anymore! LOL that is beautiful, thank you! I also have dream fragments, it is one of the most OP low level items in the game! I actually put bleed remove on my mana flask because it gives me 6 uses vs hard boss. Now I can put shock there. Immune to chaos, freeze, chill, maim, stun, and soon bleed! Now I just need shock, and I am getting "Silenced" too lately, but I can usually escape that. Yes, I expect a soulrend nerf, the leech is just crazy. Got lucky with a 10.5ex jewel sale and bought a 750es chest with 3bl3wh link for 10.1kes now! My shield has nothing I won't miss so that APEP is makin me drool!